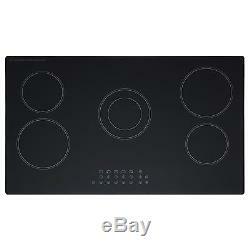 SIA CHC901BL 90cm 5 Zone Frameless Touch Control Electric Ceramic Hob in Black. 5 Years Parts 2 Years Labour Guarantee. Dimensions: L860 x W510 x D40mm. The CHC901 is a stunning 90cm black 5 zone touch control ceramic hob which is contemporary in design to add the wow factor in your kitchen. It is easily operated via the touch control design , allowing you to switch between different functions in a simple touch! The dual zone is perfect for creating versatility whilst you cook, opting for more pan space on this element whilst working slightly more quickly and effectively than the single zones! Its sleek frameless design is sure to boast elegance in your kitchen, with its design matching leading brands in the market due to it creating a contemporary look! Its easy clean surface means you will never have any issues with keeping your appliance looking and working like brand new! And it doesn't stop there.. Create peace of mind when you're not in the kitchen with the child safety lock function, as this feature locks the hobs functions when children are present, ensuring maximum safety when your child is in the kitchen! 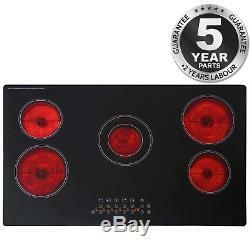 The residual heat indicator informs you of when your hob is safe enough to touch, which is done so through the red light, which automatically goes off when your hob has cooled down, and.. The automatic-switch off mechanism switches the elements off when cookware is removed from the hob, again ensuring safety at all times! This 90cm ceramic hob is the perfect choice for those who look for a sleek, safe appliance with every use and to seal the deal, you're provided with a. 5 year parts 2 year labour guarantee. 9 power levels Front touch controls 99 minutesTimer Overheat protection Residual heat indicator Frameless design Child safety lock Surface material Glass Colour Black. Front Left Zone 1.8KW Rear Left Zone 1.2KW Rear Right Zone 1.8KW Front Right Zone 1.2KW Middle Centre Zone 1.7/0.7. Electrical voltage 220-240V Frequency 50-60Hz Max current safety fuse 40A Nominal power 7.7KW Weight 13.5kg Installation min 650mm from cooker hood. 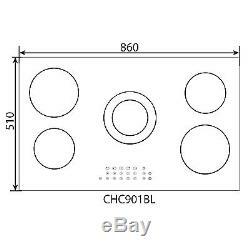 L860mm x W510mm x D40mm Worktop cut out dimensions - 830mm x 485mm. We are committed to providing the highest level of customer service available, however should you not be 100% satisfied with the goods you receive please refer to the following below. All goods should be received back in our office within 14 days of receipt of goods. Please note that this does not affect your Statutory Rights under the Sales of Goods Act 1979. All goods should be checked within 24 hours against damage in transit. Failure to report this to us within this time frame will make any claims void. Once the return of an item has been confirmed with ourselves, the return has to be completed within 14 days. To speed up the identification of your return, we require your full name and order number to be clearly highlighted on the outside of the packaging, in such a way, that it does not damage the original product or the packaging. You have a statutory duty to take care of the goods. Damage or distress caused or allowed by you to the product may void your right to return the product. You are responsible for the cost of sending back the goods. They should also be insured in case the goods are damaged during return transit. Please do take advantage of this service so any defects can be reported immediately and the goods taken away and exchanged for a quick resolution. If you do not intend to use your goods immediately, please open and inspect them before storing. NOTE: Please do not try to fit a damaged item/appliance without calling us for advice first. Faulty Goods On rare occasions products may develop a fault. Our policy for dealing with faulty goods is intended to ensure you get the fastest resolution possible and minimize the time you are without a working item. The policy for dealing with faulty items differs depending on the product type and when the fault developed. Depending on the above mentioned circumstances we will aim to either repair or replace the appliance. We will offer resolutions according to the timelines outlined by the Consumer Rights Act 2015. Nothing in these terms will affect your legal rights. Ireland, Isles of man, Isle of Wight & Scilly Isles. Shetland Islands and postal code areas AB37-38 AB41-56 TR25 TR21 IM BT ZE PH50 PH49 PH30-44 PH17-26 PA60-78 PA20-49 KW IV HS KA27-28. 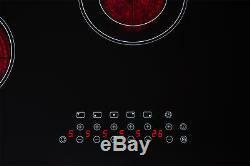 The item "SIA CHC901BL 90cm 5 Zone Frameless Touch Control Electric Ceramic Hob in Black" is in sale since Thursday, July 13, 2017.